An Italian Point of View is Alan and Tracy’s journal about their decision to retire abroad, planning for the move and their experiences along the way. This journey started many years ago. One of those moments that, although unknown at the time, changes the course of your life in a drastic way. That change happened when Tracy was invited on a cruise with her Mom (Etta), her Aunt (Deb), and her Sister (Trina). A week-long cruise to the Mexican Riviera that became the catalyst to our desire to retire and live abroad. Tracy came back from this vacation and told Alan that they should consider living in a place like Mazatlan’s Old City when they retire. At first Alan wasn’t thrilled with the idea, then a few years later (on yet another cruise to the Mexican Riviera – the second of many), we found ourselves right back in the Old City of Mazatlan. Alan saw right away what Tracy had seen on her first trip, the soul of the city was engaging, relaxing in a way that was rarely experienced in a family of 10. [Yep, that’s right two of us and 8 (eight – not a typo!) children.] We both fell in love the idea of retiring to a such a beautiful place. This trip spurred the research process and over the next six years we looked at Mazatlan, Costa Rica, Panama and Belize. Originally thinking that we should try to stay close to the U.S. for friends and family to visit — and close enough for us to get back to the U.S. if there was a health emergency. We narrowed down the choices to Belize and delved into some serious research about real estate, retiree visas, even a list of duty-free items we could bring into the country within the first three years. We researched activities, shopping, computer and kitchen appliances that we would need. It seemed like the perfect choice especially since the tiny country is a former British protectorate and the official language is English — which would have come in handy as neither of us speak a foreign language. After years of research — government Web sites, books by others who have moved abroad, hundreds of Google searches, et.al. — we were taking another trip to the Mexican Riviera, when another chance encounter changed the direction of our plans again. While on our third cruise to the Mexican Riviera we were sitting down and having a nice, cold beer at a local pub in Mazatlan’s Old City that we really like. There we met a gentleman named Warren from Canada. He was in a wheelchair due to a trucking accident that caused his early retirement and had a cute little pup with him. He sat at our table and chatted with us a while and was kind enough to share his story. Warren lived in Mazatlan six months out of the year and in Canada the other six months. His little dog was quite an international traveler herself as she accompanied him in his travels. He mentioned that he kept an apartment in Mazatlan as it was far easier than home ownership and with the prices as low as they were, totally affordable. That was our second catalyst — we didn’t have to own a home, we could rent and move when we wanted. We had planned from the beginning to live like a couple of locals and not hole up in an expat community. We are both fairly adventurous and the idea of living in conditions similar to those in the U.S. just seemed pointless, if we couldn’t absorb the culture and soul of a place then we might as well stay put in our three-bedroom, two-bath, two-car garage home. But our talk with Warren had our brains spinning. If we didn’t purchase a home then we could live anywhere. We could live in Belize, move to Mazatlan, Costa Rica, spend a few years in each and not have to pick just one place to settle. That conversation sealed our fate and from that moment our focus shifted to early retirement and moving abroad. After much research and discussion we enthusiastically decided on moving to Italy. When we were considering Latin America, there was always talk about frequent visits to Europe and to Italy is particular. Both of us love art, architecture, and history. According to UNESCO, 60% of the world’s great art is in Italy. We both have degrees in art history and greatly wanted to experience Italian art and architecture in person and in-depth. Tracy’s heritage is Italian. Her family instilled in her a great love of Italy and Italian culture. Tracy had a great motivation to explore the country of her ancestors. Italy was a wonderful central location to explore Europe, North Africa, and Asia as well as the Italian peninsula. Regional trains and airline in Europe allow more cost-efficient travel than intercontinental flights. The food and wine are, of course, the world’s finest. 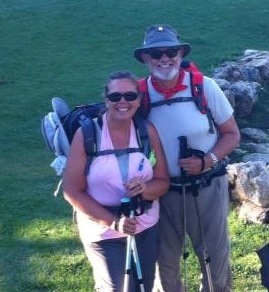 Finally, we both loved the romantic idea of an extended delayed honeymoon as retired expatriates in Italy. However, as with most things in life, our first choice location did not end up being our final destination. We found that getting a visa from the Italian Consulate in Los Angeles was a bit more difficult than we had expected. Our plan all along had been to travel and live as expats. So when the process became cumbersome we decided that the universe was trying to tell us something. We pulled our application, bought a map of Europe and took a couple of days to select a new country. We decided on France and on Wednesday, January 2, 2013 headed for the consulate in San Francisco. Our meeting with the consulate officer lasted approximately 15 minutes and our passports with visas were mailed back to us on Friday. The following week we had a new countdown calendar, a new apartment lease and a new copy of Rosetta Stone, this time in French. And viola, we are expats! Update: May, 2014. We are now at the beginning of our second year as expats and still loving every minute! Our visa renewal went very well and we are happy to have our residency cards for France. This has been such a wonderful experience, now we just need to learn the language! Update: February, 2016. We are nearing the end of our third year as expats in France. We moved April 2015 to Argeles-sur-Mer where we had found a two-bedroom holiday rental just 150 meters from the 7 km of sand beaches that make this area a destination for the French people who come each year to spend their vacations here. We are in the process of moving as we have just recently acquired a three year lease on an unfurnished apartment less than a kilometer from where we currently reside. Thanks Mike!, We linked back to you too. Thank you Margaret! Our intent was to share with family and friends and especially our grandchildren our adventures, the cultures we experience, our trials and the humor we find in our lack of speaking a second language!